Around the home and shop happenings. 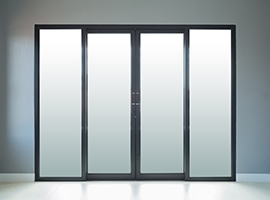 We need to add a very industrial externally mounted door seal kit to our pair of workshop double doors since these doors are only opened to bring in or remove a heavy piece of machinery, tooling or support items for our internal workshop. The main goal of this seal kit addition is to help in the external or outdoor conditions like wind, cold, heat, dust, sand and variation in external moisture and arid environments in an effort to aid us in the quality of our machinery and tool rebuilding and ultimately to help insure the best quality products we will be producing for you. We have been talking about the following machines, even shared in our last bi-weekly BLOG post about how these little machines are ready to be added for us to use in the making of our American Machined products and tools, and we are not a pair to disappoint. Mondays YouTube video from our Shop Adventures number 13 shows these machines running and how able they are sure to perform in their duties. Flume F53 Watchmakers Lathe Base. German Made Micro Drill Press. How to fuse a micro machine motor pulley belt to last. What a rare Made in the US precision tool maker set of vises and a sine plate are going to be applied to. Hint: these precision machine vises are for the Barker Engineering Company Milling Machine a vintage version of the AM Series or larger mill class as the company still makes AM larger and PM smaller Series milling machines. We are finally back working on these 3 Levin & Son machine tools after a short delay caused by some of the now finished above machine tools and the major bearing removal for our Barker Milling Machine pulley, a bearing removal we once tried to get out 2.5 to 3.0 years ago with no success. We dedicated a full YouTube video to the topic in Shop Adventures 12 featuring exclusively bearing pullers, removers and such, and brought along the viewers for a first hand look at us getting a blind hole bearing out after we machined on our machine shop lathe, a custom bearing puller and filmed the removal of this bearing. The Levin Lathe rebuild delay was mostly because the Vintage Barker Milling Machine will be needed in the manufacturing of the Active Atom product but that bearing was the final component of the thousands that it takes to disassemble, rebuild, replace and rework and then build an entire 6.25” Y by 20.0” X table bed milling machine put back together. Patrick and Lance share above, the discussion of rebuilding a Baker Milling Machine but there is actually another bonus machine rebuild taking place right now. If you are wondering, do these two men really need to rebuild all of these machines and tools just to produce their product? 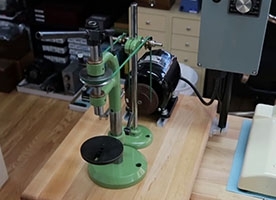 We have had many of these fine vintage precision machines and tools for many years but were always too busy making watch, timing and instrument parts for others to get to enjoy the process of rebuilding these fine machine tools. We do not want to stop production and we are not real sure what exact machines or tools are going to come into play in the making of our product. And the last thing we want to have happen is to have to stop the YouTube Channel Shop Adventures filming to rebuild a machine or tool. Remember, this is a very unique product we are making and what is really special is that we are filming the product making process on the machines with the tools you might have been watching through the YouTube Shop Adventures Channel showing Lance and Patrick rebuilding these precision machines and tools along the way getting ready to begin producing these products for you. So we want to be very sure to have all we can control within reason to bring you along each week showing the drawings, designs, CAD prints, programming, tooling making, CNC machining, manual machining, prototyping, production runs, finishing, coatings, assembly and even the packaging and shipping as smoothly as possible. Always filming showing our weekly makers progress from that very start through to the delivery of the products to their new caretakers. This is a really quiet time for us as we just keep our noses to the grindstone, NO are you kidding. If you have been paying any attention to our work and our devotion to build a great multigenerational product that will not just last the test of time but actually stay relevant through the trials of time. Saying all of that, then you know even when we have little to report that it is not to share that we have not been producing anything, it only means this is not a time to share details while we work through our thoughts and prototyping processes. I mean, we Patrick and Lance have been performing this way for decades and the system we apply to making things happen is tried and true in our relationship for getting the work at hand done and done right. We actually do not have anything to share about the Active Atom product right now and this is because we are truthfully always thinking what it is going to be, do, offer and intrigue its new caretaker with. We mean we can just pull any of these drawings like the one Patrick is currently turning into a CAD Computer-Aided Design blueprint and say lets just go with this or that but this is going to need to be a product of really important significance to the two of us as a new product. But it also needs to be something many people would like to enjoy having sharing and such while finally realizing that just a mere few will be able to own the Active Atom products because they are hand worked, made in limited editions then serial numbered and are a symbol of pride or proud prominence and so forth to its holder. We can share that we are looking to make a fully functional, multi piece assembled, extremely precision in its dimensions and only in a tough as nails miniature model of a full sized product or tool. These are just some thoughts turned into engineering designs we are working through while we continue (major rebuild and product progress shared above) to wrap up many of the machines and tools being rebuilt that will allow us to begin making the Active Atom product in the first place. Until we stop rebuilding machines and adding new things, please come along and enjoy these two men living and working in a rural California Desert town through our weekly YouTube Series Shop Adventures.